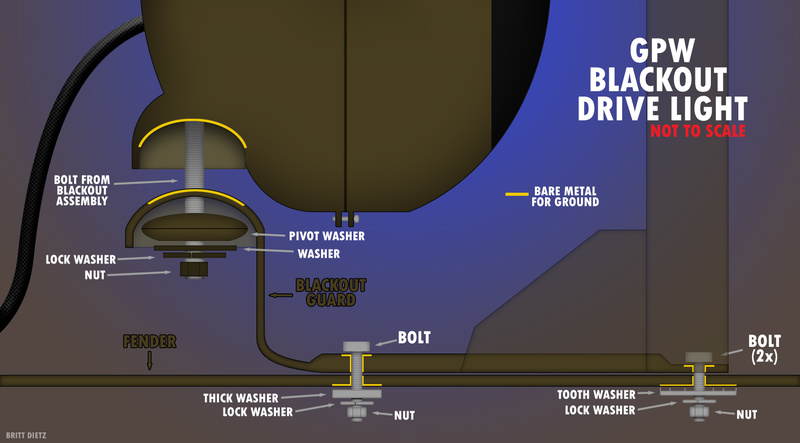 Blackout Drive Light, fat adjusting washer (1), BO Guard (2), Washer (3), Lock Washer (4), and Nut (5)? So where would the star washer go in this lineup? 1944 Ford GPW undergoing restoration! The toothed washer(s) goes under the fender where it can cut through and achieve a good ground. There are TWO of them, using the two bolts that hold the front of the Fender BO bracket. Thanks Alan! I have the RFJP book that details the breakdown, but it's difficult to figure out some of the parts at times. for example, most diagrams I've seen don't show that adjusting washer. With your numbering it should go light then bracket(2), strange washer (1) then 3,4,5. The light, bracket and funny washer form a ball joint to allow light adjustment. The funny washer turns the concave surface of the bottom of the bracket into a flat surface for the lock washer and nut to secure against. As mentioned #1 is upside down in your photo. Scrumps, you are the man! Thank you! So, that leaves the question then, what all (in those bunch of washers/nut) needs to have metal to conduct the ground/neutral? I would imagine the 'funny washer' would need to have metal exposed to send back to the Blackout drive light guard which then has some exposed metal to send to the fender? I also would imagine the underside of the guard where it touches the funny washer would need to have exposed metal? Since I can't really find many references on what needs to be metal, I put this (not to scale) diagram together. The areas in yellow I assume need to have the paint removed for good contact to the fender. Look about right? I hope this diagram helps people looking for this information in the future as it would have helped me! I'll change the diagram if someone spots any errors. Last edited by warbirdphotog on Thu Feb 14, 2019 5:29 pm, edited 2 times in total. Nice diagram! 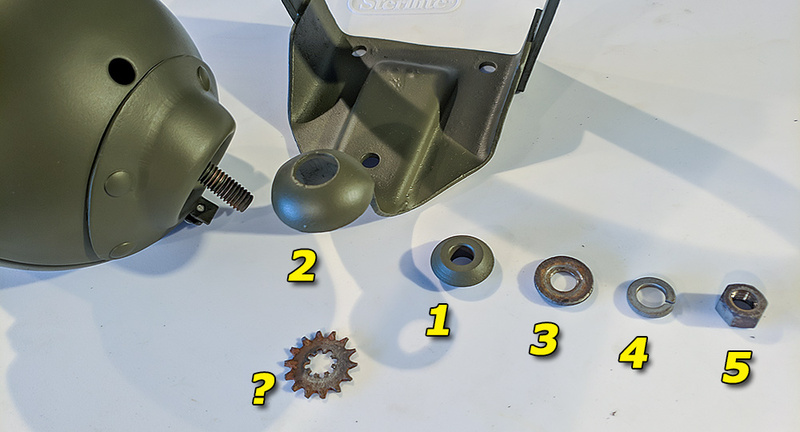 The only issue i see with the diagram for a GPW (completely different for a MB) is the order/components to mount to the fender- there is no flat washer on the front 2 bolts underneath and no tooth washer on the rear bolt. I think the bare metal parts marked in yellow are either incorrect or incomplete. The only area that I've found that appeared to be bare (rusty, now) is the concave portion of the light body and the convex portion of the bracket. On your drawing it would be the area between what you have labeled "bolt from blackout assembly". This way the light housing, which the bulb is grounded to, is directly grounded to the bracket, rather than indirectly as would be if this area were painted and rely soley on the fastener. Thanks Ian! That helps, I'll redo the diagram and show the other bolt spots. I figure someone with this issue will find this thread and the diagram will be helpful. I believe so. BTW, that's a beautiful diagram! That is a great diagram! 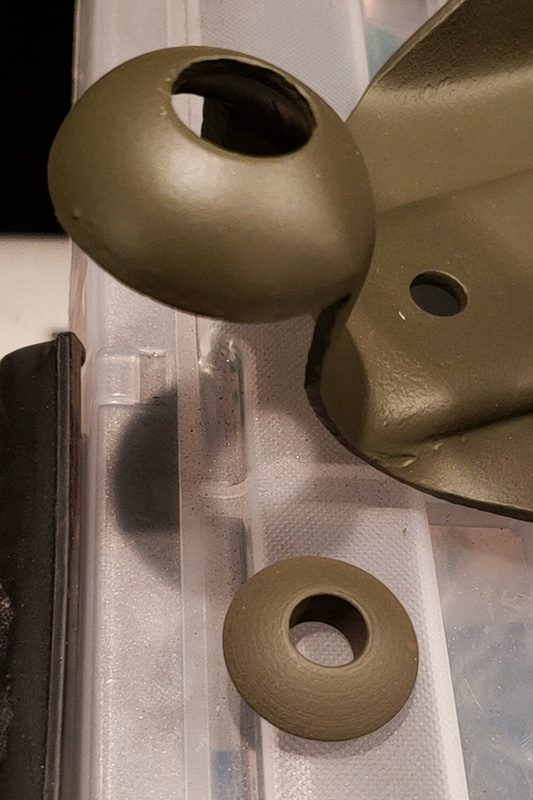 Only comment I have is the shakeproof(star/toothed) washer is designed to cut thru the paint and form a bond without the paint being removed. The GPW design appears to be missing the top washer to function properly if only one was specified or maybe it goes between the bracket and fender like on the hood hinge. Thank you both! I'd love to do more of these diagrams if I have the information to make them correct. Mark - That's true on the star/tooth/shakeproof washer. I could remove the bare metal there on the diagram, but I figure that helps let someone else know to make sure the washer, or the lack of paint somehow, it there for a good connection. I haven't seen a shot of a GPW Blackout Drive Light (so far at least) with any washers on the top under the bolt head. Are there any other GPW photos of the blackout light that might shed light on this?